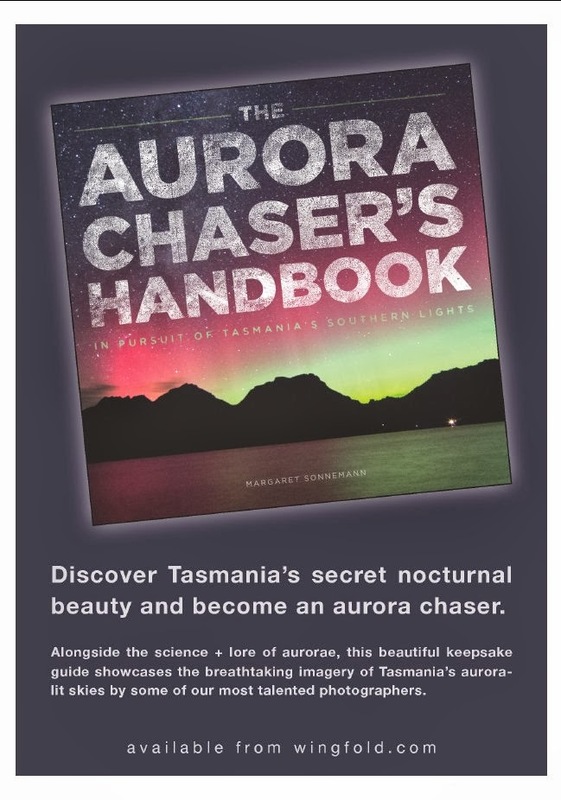 Us Southern hemispherians have been having some success at getting images onto Space Weather recently. First Paul Moss, and now John Drummond, both New Zealanders, have had their images linked to by Space Weather. Have a look at this beautiful image of Pojmanski, then at this page full of images. It's also available at Amazon for around $24 US, buy it with Mark Pekrah's "Unintelligent Design" or Barbara Forrest's "Creationism's Trojan Horse: The Wedge of Intelligent Design". I must say I'm seriously chuffed. I've had chapters in two other books before,("Prejunctional Control of the Autonomic Nervous System" and "The Chemistry Biology Interface") neither went into reprint. 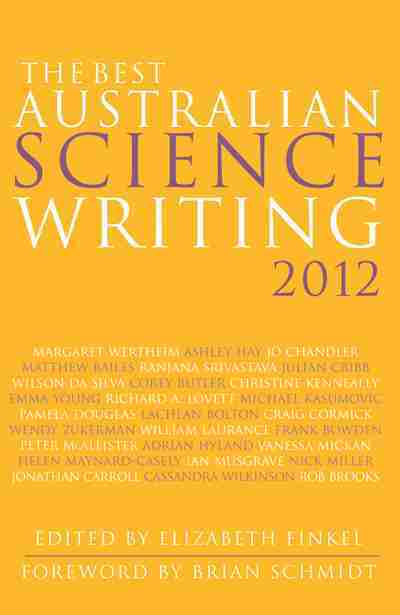 But WIDF is not only in its third edition, but paperback! That is almost unheard of for an academic publication (Doesn't impress the Department of Education, Science and Training though, they would rather have quantity). This was the best morning for Pojmanski hunting in days. The clouds which had plagued us had finally gone, the morning was crisp and clear with much of the junk in the sky washed away by recent rains. There was no breath of wind, and the Milky Way could be seen arching across the sky. 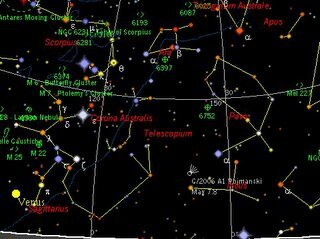 Better yet, the comet was just above beta Capricornii, so you could hardly have a better signpost. I picked it up easily in binoculars, but couldn't see any tail (this is probably my eyesight, I seem to be poorly sensitive to diffuse cometary tails, other have reported short tails in binoculars). As well, Venus was a blazing beacon, I saw an Iridium flare along Scorpius, and as the sky paled I picked up a thin sliver of Moon rising above the eastern horizon. Not a bad morning at all. 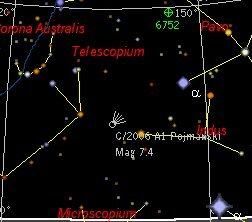 Tomorrow the comet will be under alpha Capricornii, well worth looking for. The next couple of days will be the best time to catch Mercury this month. Mercury is in the western evening sky, just. It sets shortly after civil twilight, so if you have a clear, level western horizon, try looking for Mercury just above the western horizon about 20 minutes after the Sun sets. On Wednesday March 1, the one day old crescent Moon will be just above Mercury, and will aid in spotting it. After that, it will be almost impossible to see until it turns up in the morning skies again. ".. you can ride it if you like, its got a basket a bell that rings and things to make it look good." (Pink Floyd) I have just celebrated my birthday, and I am now 75.15 Venusian days old. The Bettdeckererschnappender weisle and the young un's bought me a bike for my birthday (despite the broad hints about a Meade LPI). My current bike was bought second hand in Berlin 15 years ago, you can't buy tyres for it any more, so it will be soon unrideable. Hence the nice new shiny bike. We went down to Semaphore for brekfast at a plant nursery/cafe (where you can watch your children destroy plants look out over beautiful plants), then picked up my new bike and went for a ride along the new beach bike path. This is probebly the first time I have ever had a new bike, so I am extraordinarily chuffed with it, and it rides like a dream. I look forward to taking it out on touring trips, the Bettdeckererschnappender weisle and I used to do a lot of bicycle tourning in the years BC (Before Kids). Later on we went out to see some standup comedians from the Adelaide Fringe Festival. So, not occultation pictures yet, and there's a lot of astronews I have to link to, but not tonight. Click to enlarge (or even see anything sensible) Pluto, Charon and P2 as seen from moon P1, image generated in Celestia. If you have been hiding under a rock, you won't know that a team using the Hubble Space telescope found two more moons of Pluto. Now the full report of this discovery is out in the journal Nature. The actual articles require a subscription, but you can read the informativeNews & Views article, and listen to the Nature Podcast which gives details of the discovery. Unlike Charon, which is almost the size of Pluto, S/2005 P1 and S/2005 P2 (don't those names just trip off the tongue), are less than 100 Km in size, Charon and the tiny Moons probably originated in a giant impact with Pluto. I've made a Celestia SSC file for S/2005 P1 and P2, you can download it here (then copy it into your extras folder in Celestia). WARNING, the published paper didn't contain some data, like Ascending Node, Arg of Pericenter and Mean Anomaly. I've used the values for Charon for these until more complete data are published. So the orbits won't be entirely accurate, but reasonable enough to go on your own flight through the Pluto system. I'm writing a CEL script that will take you on a tour of these new worlds. I'll put that up soon I hope. Update Pop over to Tom's Astroblog for details of the February 15 confirmation of the Moons existance. Also, Nature have put up a free streaming video interview with the Moons discoverers. 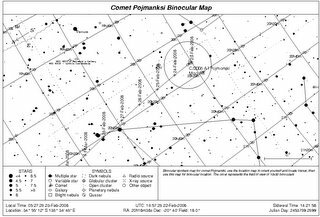 Maps of Comet Pojmanski A1 now up. 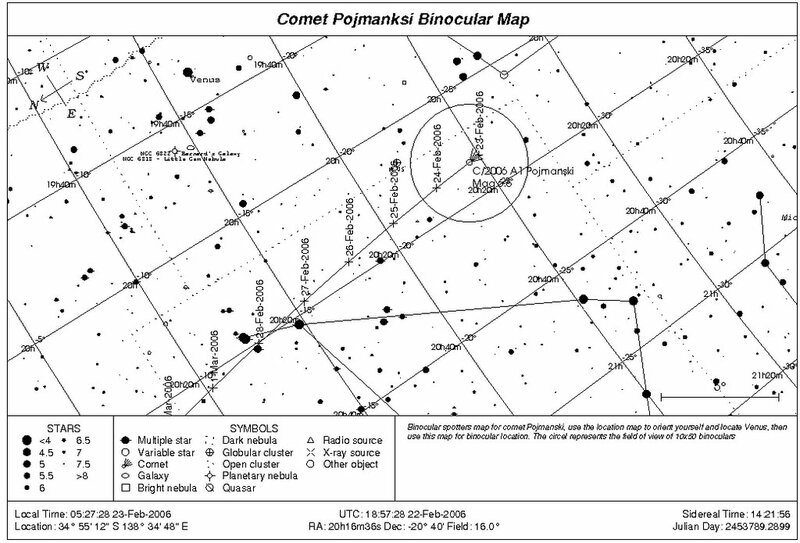 I've put up new spotters maps for Comet Pojmanski here at Southern Skywatch. Also check out Paul Moss's images of the Comet. Via Space weather. Have a look at Ed Morana's ISS transit page. 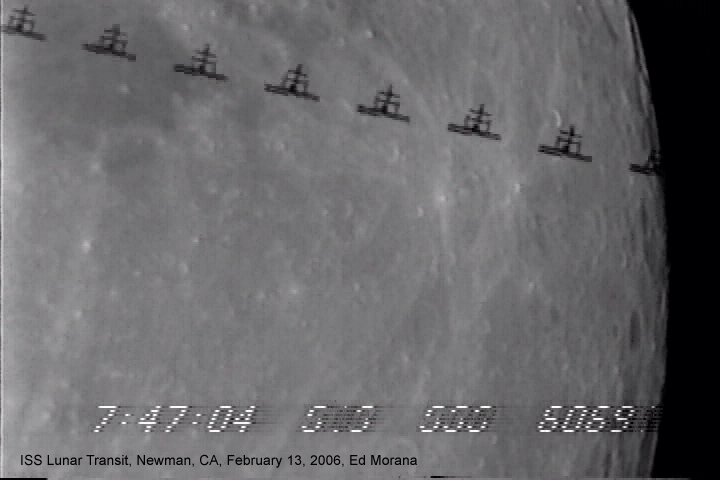 His latest catch of the ISS passing infront of the Moon is simply stunning. There are some lovely animations at his site as well. This low bandwidth 165 K windows media animation is just ataste of the high quality shots available. The Sun is as smooth as a babies bottom at the moment, devoid of Sunspots, but a gust of solar wind cause aurora in North America. Visit Space Weather for images and details, and check out this satellite image of the storm. What a wonderful morning, I finally saw the elusive Comet Pojmanski and imaged the occultation of Antares, Jupiter and Venus. The skies were clear, the weather crisp and Scorpius arched over my head in the predawn dark. Just magical. Comet A1 Pojmanski has eluded me over the past weeks, even though it is bright enough to see in binoculars (and everyone else seemed to see it) as my south east horizon suffers form light pollution. 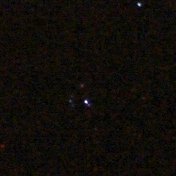 This morning though, with good dark (for the suburbs) skies, and a distinctive kite shaped group of stars in Sagittarius as a guide, I finally picked up the fuzzy dot that is Pojmanski. As I had the scope dedicated to imaging the occultation, I didn't have a telescopic view, but the binocular view was quite satisfying. Pojmanksi will be at its brightest over the next few days (somewhere around magnitude 5.5). It's not far from Venus, if you use the image above (click to enlarge, I'll put up a proper spotters map later tonight hopefully), you should be able to locate the comet easily enough in binoculars. At astronomical twilight (when the sky is still very dark), the comet is around 15 degrees (about 2 and a half handspans) above the horizon, and should be relatively easy to spot (Northern hemisphereians, the comet will not become visible for a few days yet). On Sunday 25 Feb, the crescent Moon will be close to Venus, so it will be worthwhile getting up to look for the comet at an early hour. In the sprirt of animation frenzy, I present my animation of Venuses phases. 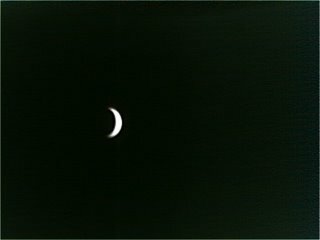 Unlike my current Venus animation project, where I am trying for an image every 3 days, this series of 2005 shots were somewhat irregular, although often between 2-1 weeks/image. 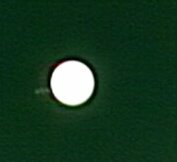 The effect isn't bad, not as good as this animation of Venuses phases, but not bad for a 114 mm Newtonian with a $100 webcam. So I got up early to image Venus again, and did an extended shoot of Jupiter. 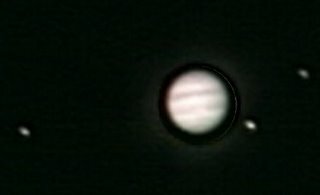 I imaged Jupiter every 10 minutes for an hour, shooting a short exposure for the bands, and a long exposure for the Moons. Then I overlaid the images to get this animation. You get Europa zooming past Io, with Ganymede in the frame as well, and you can see features rotate (no red spot, it was rotating on just before sunrise). For some reason in the middle of the sequence some of the shots just weren't clear, so the features blur a bit. If you want to see animations of the planet itself, click here, and if you want to see the Moons animated alone, click here. 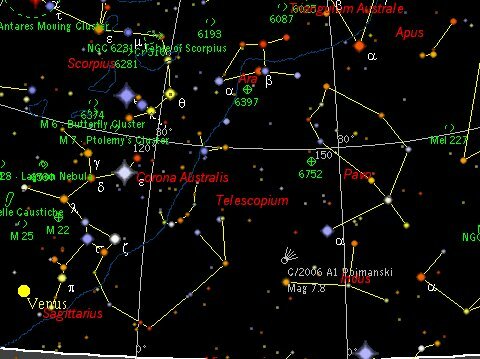 On the Morning of Wednesday Feb 22 the Bright Red Star Antares will be Occulted in Australia, Indonesia and Malaysia. In Australia, Western Australians will have the best view, seeing the entire occultation. From Perth, Antares disappears behind the bright limb at 3:15 am local time, and reappears from the dark limb at 4:21 am. 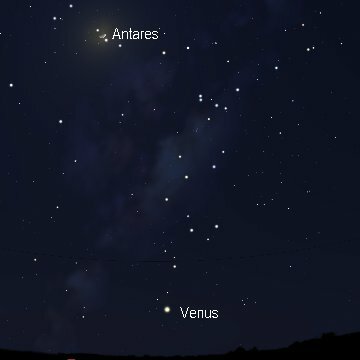 People in the central states will see Antares disappear behind the bright limb shortly before civil twilight (6:15 ACDST in Adelaide), but Antares reemerges after sunrise. In the eastern states Antares encounters the Moon on or around sunrise, but Antares and the Moon will be attractively close in the morning twilight. 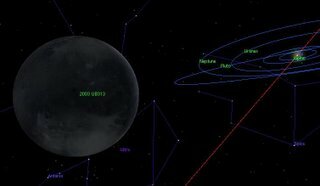 The Moon will be around six handspans above the eastern horizon, and readily visible in the early morning. Begin observations at least 30 minutes before the occultation time to familiarise yourself with the sky around the Moon and locate Antares. People in the central states will probably require binoculars or a small telescope to see the occultation. In WA, it should be visible to the unaided eye, but it will look better in binoculars or a telescope. In Indonesia and Malaysia, the full occultation will be visible. See this page for local city timings in Universal Time. On Thursday morning I managed to catch Io as it came from behind Jupiter. This image is a stack of 4 (which were stacks of 30-60 frames done in Registax) stacked with The Gimp. Jupiter is over exposed so that the Moon can be seen. Io slides progressively into view in these frames, separated by roughly 15 minutes. This is an animation of the same event (you have to click the link to download the 250K animated GIF file). 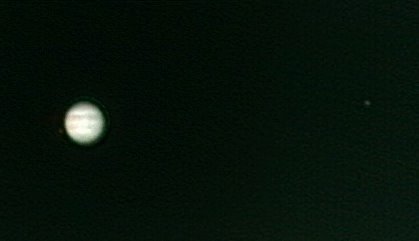 Here I have covered Jupiters overexposed disk with the contemporaneous properly exposed image of Jupiter. The animation was made in The Gimp as well. I need to work on my animations, but this bodes well for future eforts. 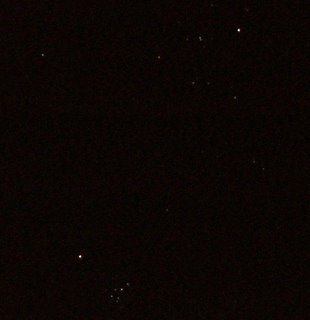 Click image for larger version (where you can actually see the Pleiades). The image is a stack of 4 images made in The Gimp, after dark frame subtraction. 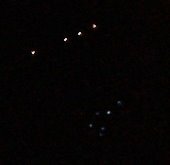 The images were taken on the 15th, 17th, 18th and 19th as Mars zoomed past the Pleiades. A very lovely sight in binoculars or the naked eye. I tried to take all the images at the same local time, but children, clouds and a variety of other issues prevented that. Now that I've worked out stacking (well, mostly worked out stacking, with a big tip of the hat to the hard working Megan), now all I have to do is get Blogger to show my images as I see them on my computers image processing software. Terragen! A fantastic terrain simulator. Pop over to Dirty Skies to see some fantastic VR landscape renditions with Terragen. See also DaveP's Mars-like landscape made in Terragen. Out swimming with the boys today, under a lightly over cast sky, I happened to look up to see the Sun circled with a delicate rainbow, a Sun Halo. It didn't last long, but it was beautiful. Got up early this morning to try and catch the comet. With the Moon and horizon murk it turned out to be nigh impossible. I think I saw a fuzzy dot that was the comet, but I may have imagined it. But I got some good shots of Venus and Io near Jupiter, so I'm quite pleased. In the meantime, follow this link to a great shot of the comet earlier in February. Specks of cometary dust from comet Wild 2 collected by the Stardust mission have been sent out to labs world-wide (check out the webcam of the Stardust sample preparation labs). The Journal Nature has an exciting report from one of the Labs on this dust. Unfortunately, they didn't report the actual findings, as no results will be released until the Lunar and Planetary Science Conference in Houston, Texas, in March this year. However, initial chemical analysis scans using Scanning Electron Microscopy were surprising. The leader of the team said "Whatever it is, it's weird". Now that is a teaser. I will be waiting eagerly for March. Click the image for the full sized version (people with older screens will see just a couple of white dots in the Thumbnail). Mars is close to the Pleiades cluster between now and February 20. This is a rather beautiful sight, so go out and have a look in the early evening, before they set. The combination looks pretty good in binoculars too. The image is a stack of 3 in the Gimp, with dark frames subtracted individually (it was going to be a stack of 4, but one image was unfocused for some reason. I think I'm getting the hang of stacking now. Galileo Galilei was born in the Itallian city of Pisa on Feb 15, 1564. Among his numerous achievements was the production of an improved telescope that allowed him to make astronomical observations. He has been called the "Father of Astronomy". He discovered the Moons of Jupiter, the phases of Venus, craters and mountains on the Moon and made detailed observations of suspots. His work led him to support the Heliocentric theroy of Copernicus, which famously brought him into conflict with the Catholic Church. In the wake of the George Deutsch affair, where a 24 year old Presidential appointee to the PR section of NASA tried to censor scientists over global warming and the Big Bang, there have been claims that Australia's Commonwealth Scientific and Industrialisation Organisation has been censoring scientists too. This mostly relates to Greenhouse gas work. Our government isn't a fan of global warming, and is not a Kyoto signatory. On Monday night there was a 4 Corners documentary on these claims. I didn't see it as I ended up going to a school parent-teacher thing. From the transcript and this report it looks like there is some interference, although not quite as balant as in the US. However, this ABC story isn't as sanguine, and includes examples of other alleged interference in scientists work. That story also features a bioethicist sounding off at a complete tangent. Is still elusive. Various reports have it as bright as magnitude 6, while the Skymap ephemeris lists it as magnitude 7, either way, it should be binocular visible by now. Except for the cloud. Got up before Astronomical twilight again, and went outside just as the cloud boiled across the horizon, Jupiter and Venus glittered briefly through the cloud, but it wasn't worth getting the scope out. The comet lay firmly behind the cloud. Made for a nice sunrise though. 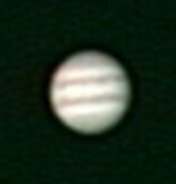 With the lessons learned from the morning Jupiter session, I fiddled a bit with the setting to get the slowest shutter speed/ lowest gain combinaton I could get and still get a recognizable image. The result is the image on the left. It's not markedly better than the previous image a week ago (on the right), but the colours are better, there is a bit better definition in the rings and the equatorial band and polar cap is a bit clearer. Conditions were not ideal, turbulence was still high, there was a bit of wind and with Saturn not making it much over 30 degress of the horizon, seeing will never be as good as with Jupiter (which was around 50 deg above the horizon, with much stiller air). Still, I can see with better conditions Saturn might turn out okay. Now if I can just get around to setting up my Barlow lens. Venus, just because I could. I'll try and do weekly to half weekly images in order to do an animation. But I won't inflict an image every week on you. Today is Darwin Day, the anniversary of the birth of Charles Dawin, a consumate naturalist whose theory of natural selection revolutionised biology. In honour of Chas, we went to the Flotilla for Kids in Port Adelaide. Darwin visited Australia on his voyage in the Beagle, which was the catalyst for his theories. He landed in Sydney (later, his manservant Symes Covington would live in Sydney, and send Darwin materials that would be used in the "Origin"), Tasmania and Western Australia on his visit, but unfortunately not Adelaide, which was ordinarily a major port of call for ships on the "roaring 40's" route. Darwin, the capital of the Northen Territory (which he never visited either), was named after Chas. As we watched the Tall Ships go past, I could fancy myself as a naturalist on one of those voyages, sailing out into the uncharted reaches of the world, to find mazing things. My research on neuronal surbvival will never have the same impact as Chas's, but the way we conduct researcxh was changed forveer by his work. and Ganymede. 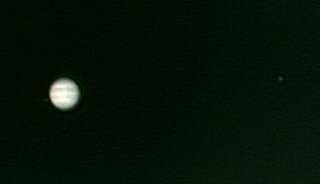 The images are composites, I shot the detailed Jupiter images at exposure times of 4 and 3.5 (on the slider) in Vega, then did the satellites with exposure times of 6 and 5. Jupiter was vastly over exposed in the satellite shots, so I just cut out and pasted the low exposure pictures. The images had a wavelet transform of 9.8, and have been enlarged 4 x and a light unsharp mask applied, but no other post processing. 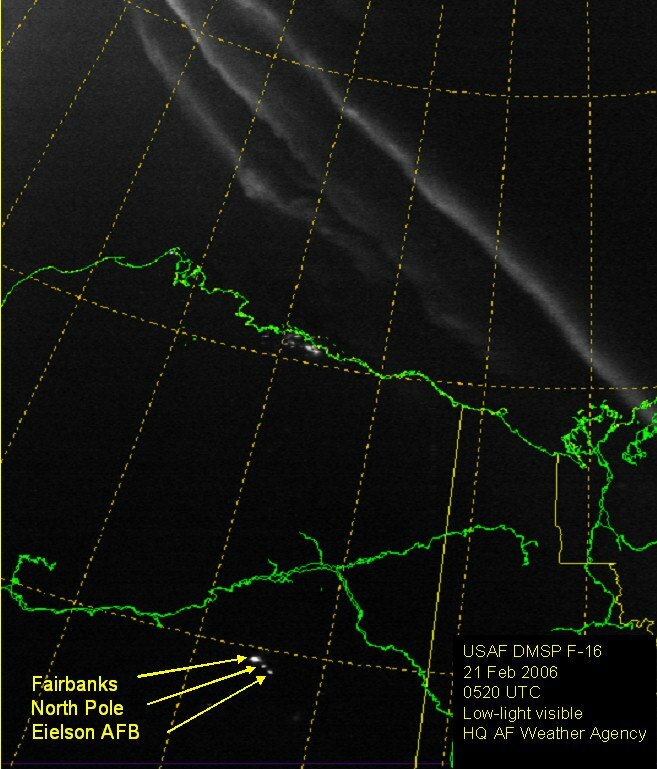 In the top image , the long satellite exposure markedly trails the satellites, the bottom image has rounder moons, but much dimmer. In the top image also, the amount of cloud detail is far less, I suspect the longer exposure blurred the detail more (and the brightness may have washed subtle features out. I also haven't selected out bad frames in these images, or corrected for chromatic aberration, so they could be better. Next time I'll keep the shortest possible exposure compatible with imaging features, and see if I can make a movie of the rotation. I was rather chuffed, as sometimes I think the details in the bands could be artifacts, but to see the same features an hour apart, rotated, means they are real. I finally got up before astronomical twilight, courtesy of Smallest One. After giving him a cuddle back to sleep, I stumbled out into the backyard with my 10x50's in search of Comet A1 Pomjanski. The comet should be around magnitude 7.5 now, and as the milky away glittered in the predawn dark, I felt confident I would find it. Except, of course, it was in the south west, directly over the city glow. I searched in vain between alpha Indus and Iota Sagittarii. Still, the morning was beautiful, Jupiter was bright above me, Venus glitters above the roof tops, so I got my scope out for some shots of Jupiter, then went to image crescent Venus. So that was when the cloud rolled in. Mildly miffed at natures perefidery (check the subtitle) I made a cup of tea and watched until the clouds turned red, then salmon pink with the rising sun. Then the clouds parted, and I shot off some images of Venus, then went back to bed. I didn't see the comet, but I saw more than enough beauty to make early rising worth while. This is the "Southern Pleiades" imaged with my little olympus muj:300 digiatl caera. The image (which you have to click on to see anything other than the two bright stars) is a stack of 6 images using The Gimp, with individual dark frame subtraction. It worked pretty well, for some reason some hot pixels made it through (maybe I did'nt use differnce properly in the Gimp), but I'm happy with the image. Here is the full image it was cropped from (warning half-meg file), it's not bad, but there is something unusual about it, any explanations? Suit Sat, a space suit stuffed with a ham radio and tossed out to the International Space Station, was originally thought to be dead, but to it's batteries failing to withstand the cold of space. But now radio amateurs have reported picking up faint signals. Can you see Suit Sat? Give it a try, it's almost in the same orbit as the ISS, so using Heavens Above or J-PASS to locate the ISS, and see if you can see Suit Sat tagging along. Radio amateurs should just tune in as the ISS goes by see the NASA site for tuning details. UB or Not UB, that is the (planetary) question. Xena, as UB313 is affectionately known, is causing no end of trouble. On January 25, a study from the Hubble Space Telescope had reported that they measured the disk of UB313 and it was just a smidgen over the size of Pluto, with an albedo (reflectivity) of 0.9, roughly the same as fresh snow. Last week, data from the 30-meter IRAM telescope was reported in Nature (subscription required for the full article). This study, using 1.2 mm infrared light, concluded that UB313 had a diameter of 3,000 ± 300 Km, (substantially larger than Pluto at 2,300 km) and an albedo of 0.6 (pretty much like Pluto). They used 1.2 mm IR radiation as at thiswavelengtht object brightness only depends on the surface temperature (calculable for its distance from the Sun) and the object size. Why the heck are the estimates so different, true the low end of the IRAM study 2,700 may overlap with the Hubble estimate (an accurate figure hasn't been given yet), but the albedo figure's way off. It may be a while before we know. All Mike Brown says on his web site is that the Hubble results will be available late February. However, both estimates make UB313 at least Pluto size or larger. Will it be called a planet now? Not very likely. There is currently no accepted definition of what is a planet. The International Astronomical Union (IAU) set up a 19 person committee in 2004 to resolve the issue, which reported to the executive committee in November. While there was a reasonable proposall that anything spherical that orbits the Sun and is more than 2,000 kilometers across should be called a planet, there were strong opposing views (including the perennial one to downgrade Pluto), so no decision has been made. As it stands, the IAU looks like it won't make a final decision until August. Why can't the IAU put together a definition? If astronomers can't, who can? Well,definingg a planet is hard, things like Earth and Jupiter are planets, by tradition, but when does a gas giant stop being a planet and start being a star? The start ofselff sustainedfusionn is an obvious definition, but what about the many large objects that just miss out on starting stellar fusion but are massive isolated objects like stars. Do we call them failed stars or overgrown planets? Within the solar system we have a continuumm of orbitingg material that proceeds from tiny dust grains, through asteroids to Pluto to the terrestrial planets, with no clear size cut off. Asteroids like Ida and Dactyl, rough hewn chunks of rock of no great size, aren't planets. If we say that anything that is large enough to be spherical under its own gravity is a planet, this will make at least two asteroids planets. Vesta is round (large enough for gravity to modify it) differentiated (ie it has a recognizable crust mantle and core, like Earth) and Ceres is also round (but probably not differentiated). If we don't take a recogniseable physical property lie self-gravitation, when does an object become large enough to become a planet? This isn't an easy question, as I said. Hence the The International Astronomical Union's current quandary. Shortly after it was found, it was obvious that Pluto was the odd one out. A ball of ice smaller than all the other planets and many moons (Our Moon, The Galilean Moons of Jupiter, Titan and Triton), it's highly elliptical orbit and the large angle of this orbit to the plane of the rest of the planets orbits were all unusual. Then the Kupier Belt objects were discovered, icy plantessimals left over from the formation of the solar system with highly elliptical orbits at weird angles to the rest of the planets. It was rapidly obvious that Pluto was just a large Kupier belt object, and there have been many calls for Pluto to be demoted, but Pluto has been called a planet for so long that it's demotion would be difficult. If we retain Pluto as a planet, then it makes sense to call all things larger than Pluto a planet (and this is the best guess for the result of the IAU committee). Since it is likely that there are several other as yet discovered icy objects out there, be prepared for the 11th and 12th etc planets to be turning up in the next few years. 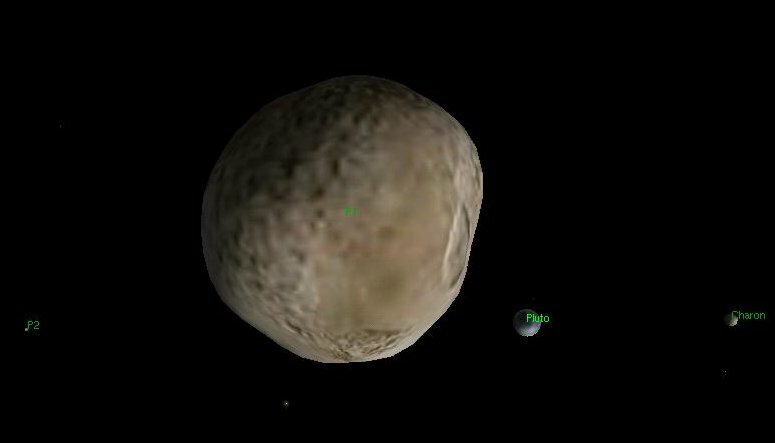 But if Pluto is a planet, what about 2003 EL61 and 2005 FY9 (or even Vesta or Ceres?). At 3/4 of the mass of Pluto, can we really justify not calling them planets? Making Pluto the cut oarbitrarybitary and not based on any science of planet formation (whereas demoting Pluto is). HereÂs the thoughts of Mike Brown, discoverer of UB313, on the subject (with amusing insight into the IAU process. As I said, a difficult question, and we will have to wait for an answer. But without Xena surprising us on, no one would have got round to making a decision on it. Sheesh! A week late! But finally Southern Skywatch is up. The conference and getting ready for the start of semester took its toll. But I got a revised paper back to the lead author today, so I feel good. So what's up in February? 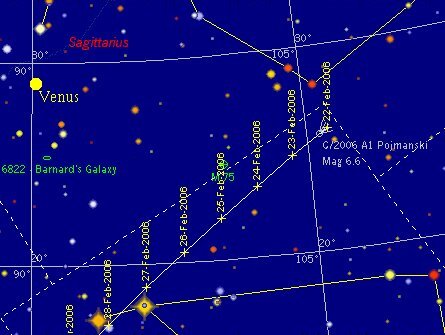 Well, Saturn is close to the Beehive cluster, really good in binoculars (if the sky isn't too murky, like it is tonight). 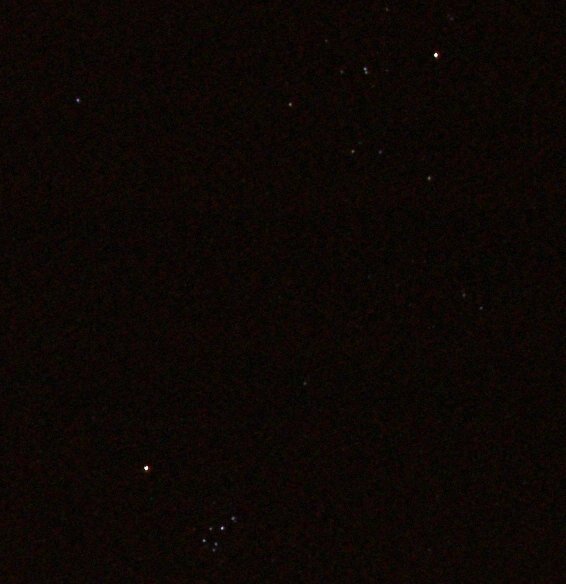 Mars zips past the Pleiades, it's already in the same binocular field as them, and looks pretty good. Crescent Venus is pretty speckky in the morning sky. I'll try and get a shot of that this week. 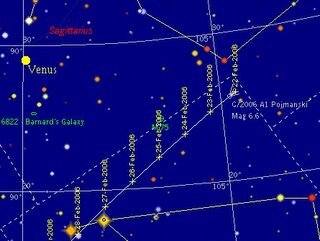 For southern comet hunters, comet A1 Pojmanski is now magnitude 7.8 and is well placed in Southern skies, near alpha Pavonis, if you don't mind getting up very early in the morning. Also, there's an occultation of bright Antares on the 22nd. This will be visible from Western and central Australia, Indonesia and Malaysia. So, it looks like a fun month ahead if the skies can stay clear for a little while. There were a great many fascinating things presented at the neuroscience meeting, but one quirky thing caught my attention. You can convert protein sequences to music. Using some commercially available software (a bargain at $500), or some freeware (Java for all OS's or Windows only) you transpose the amino acids in the protein to musical notes and then play them. Complicated algorithms are used to determine what notes, their pitch and duration and so on, but with a little fiddling you can produce haunting themes from the proteins of our bodies. We were treated to the jazz like sounds of a small protein hormone called Vasoactive Intestinal Peptide. While quirky, there is a serious side to this. The genome projects are producing vast reams of protein structure, finding patters in the plethora of variants of particular proteins is rather difficult, but when you convert them into music, altered structural patterns are immediately noticeable. Perhaps in the future we will search protein databases by sound, computer workstations resounding to the music of the strings, rather than the dry tapping of keyboards. Here's a small MIDI file I have made from the sequence of beta-amyloid, the protein that causes Alzheimer's disease. It is quite discordant, as befits such a rogue protein. I'm running around trying to meet deadlines missed by my sojurn in Sydney. 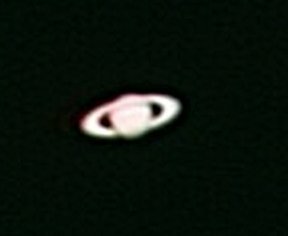 But I did take time out last night to quickly image Saturn. Although past opposition, it looks very good, this image doesn't do the ringed world justice. Still it was a lot better conditions than my last effort, you can defintly see the shadows of the ring and Saturn, and see some cloud bands. This is a stack of 60 AVI's with a touch of unsharp mask. If I went through and chucked bad frames it should come out better. The Australian Neuroscienc Society meeting is fantastic. I've listened to amazing presentations about the neurobiology of sleep and how an Australian lizard has helped us develop improved treatments for nerve injury. But for me the coolest presentation was on the use of scanning tunneling microscopy (where a fine probe tip is traced over a sample) to determine the structure of beta amyloid. Beta amyloid is a protein that is normally produced in the brain. For reasons that are still unclear (but may have to do with oxidative stress) in some people the beta amyloid folds up into a different shape (technically, a beta sheet configuration), which then aggregrates into a sticky mass that is toxic to nerve cells (again, for reasons that are not entirely clear but probably related to oxidative stress), and eventaully leads to memory loss and dementia. This presentation used scanning tunnleing microscopy to probe the structure of amyloid as it went from monomer, to dimer to oligomer. The proteins form hairpin structures, which then aline end to end to made long fibrils. It was fantastic (I spend a large part of my research trying to kill nevre cells with toxic amyloids, my students probably say my lectures do the same thing more cheaply)! What is even more mindblowing than seeing effectively protein stucture in real time (without long tedious x-ray crystallography), was that this picture is constructed by electrons "tunneling" around the space between the microscope probe tip and the protein. Quantum weirdness is being used to probe the causes of a disease that too often strikes our parents or grandparents, and ultimately may help us to tear these toxic tangels apart. I love science.